Our Outdoor Adventures are perfect for company outings, company photo shoots and holiday parties. Participants experience a very accessible or challenging activity followed by an amazing farm or forest brunch, lunch or dinner. Awe-Struck's tours are ideal for wedding party entertainment, guest entertainment and bridal party bonding. We do activities specifically designed to help everyone prepare, connect to eah other and de-stress before the big day. Just put a link to us on your wedding website or tell your guests to use our service and we will send you a check if they take a tour with us. Our Bike to Farm experiences are perfect for the entire wedding party. Ride amazingly beautiful country roads with a sweeping view of snow-capped peaks in the background! 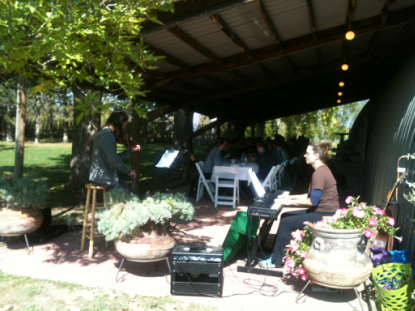 The tour will finish with an amazing field-to-table lunch on a secluded, elegant farm. The venture might just land in the top 10 list for dining experiences of your life! We can customize the distance and difficulty level for the biking tour. Elders, grandparents and others that do not want to participate in the ride can meet us at the farm for dinner. Let us show your guests the time of their lives, we can take them hiking, road biking, mountain biking, stand up paddle boarding or skiing! It is the perfect bridal party gift. We will take care of the logistics so you can enjoy this special time with family and friends. The activities can be adapted to be as extreme as you can handle or mello enough for the grandparents. We can also do fun and bonding team building activities to foster closeness between your wedding party. A locally sourced, customizable Boulder style dining experience will be the finally of the trip, guaranteed to be memorable. This is an amazing opportunity for the entire wedding party to get out and enjoy the beauty of the Boulder creek path together. We will bring a fleet of cruiser bikes to your location and carry all of the necessary food, skills and equipment to keep everyone safe and comfortable. For the price of a traditional gift, give your wedding party an experience instead. Nothing quite creates warm feelings between each other like a fun group bike ride. We can provide snacks, lunch or happy hour style tapas!